Race day is coming quick. It’s less than 3 weeks away. Wow! How does that happen? The marathon planning team is in full prep swing. We’re getting ready to make this a fabulous run for you. That single day when all the training, all the discipline, all the lousy runs and all the bliss filled runs culminate in the race day experience! If this is your first marathon or half marathon you are in for a treat. For those who’ve done it before, you know the excitement and thrill of the day! For our part we work hard to give you a wonderful race day experience. Can’t control the weather: 10 years ago for our 1st marathon there were near hurricane winds. There’s been rain. It’s been cold. In 2016 we had a freak snow storm. Interestingly, the snow storm race people rave about the most! Runners loved it. Plus we’ve had beautiful perfect days. Regardless of what we get we’ll do our best to make it a great day for you! We’re always surprised by the number of runners who tell us things like, “I’ve run over a hundred races and yours is one of the absolute best.” BTW: we’ve ordered a beautiful perfect race day for April 14, 2018. It’s the 10th Anniversary of the Marathon and we’ve put together a special SWAG package for you. Over the years we’ve done different things. This year we’ve included everything we’ve done in the past. Have a look at the picture. There’s a pretty cool duffel bag. You get a Tech Shirt with a dye-sublimation photo from the course to run-in and you get a cotton t-shirt to run-around-in. I’m amazed at the number of people who tell me how much they love the cotton Ts. Just the other day a runner said she puts it on almost every day after work. When you finish you get a Finisher’s Hat and of course your medal. The medal this year is a foundry poured horseshoe with a horse and buggy. The horseshoe was sized to that of a small horse. We strive to create an amazing recovery tent experience afterward where you can hang out with other runners and of course Chocolate Milk Shakes! By the entrance to the tent there’s a photo wall and finisher podiums if you want to stand on one. There are PR bells and 1st Race bells you can whack in celebration. We’ll have a concession stand for spectators, complimentary massages for all runners, men & ladies changing tents next to the clothing check station, in addition, you can use the showers in our wellness center (no worries there’s a rack of towels), as well as, the pool and hot tub. US Candid’s will be taking photos again this year. You can search for your bib number on their website and buy shots of yourself on the course. There’s even a Starbucks at our Refresh Coffee Bar just inside the main entrance at Village Square. Beginning Friday afternoon the recovery tent hosts Packet Pick-up, the Expo and Pasta Dinner so you can carb up. The expo features a bunch of stands including some of our Amish neighbors. if you bring a dozen of your previous race shirts one of the vendors will make a quilt out of them for you. In addition, good ole Lancaster County baked goods are available like Shoe Fly Pie and Whoopee Pies. That’s pretty straight forward because you’re registered and trained. Stick to plan. We want to see you on race day and we want you to finish well. People are starting to ask for refunds which unfortunately, like most races we can’t offer. You’re into your high mileage training. Marathoners your 20 miler is imminent. Train smart. Be careful. Don’t add an extra mile or two for good measure. The 18 to 20 mile distance seems to be the injury zone. Half Marathoners it can be tempting to ramp things up like running faster, running harder or adding a couple miles too many. I can’t tell you the number of half runners who tell me, “I felt fabulous, like I could run all day long, over extended myself and twisted a knee.” When the endorphins kick in the runner’s high is unbelievable.We live for it. Keep in mind it’s your bodies response to fatigue. I view it as a primitive survival mechanism to give you that final push to escape the T-Rex. Train smart through the runners high. Enjoy it but don’t be lured into a false sense of super human capability. It can take you out before race day. Get out there. Keep up the training. Stick to plan. Train smart so you can both start and finish well. Race Day is less than 3 weeks away! The excitement is building! 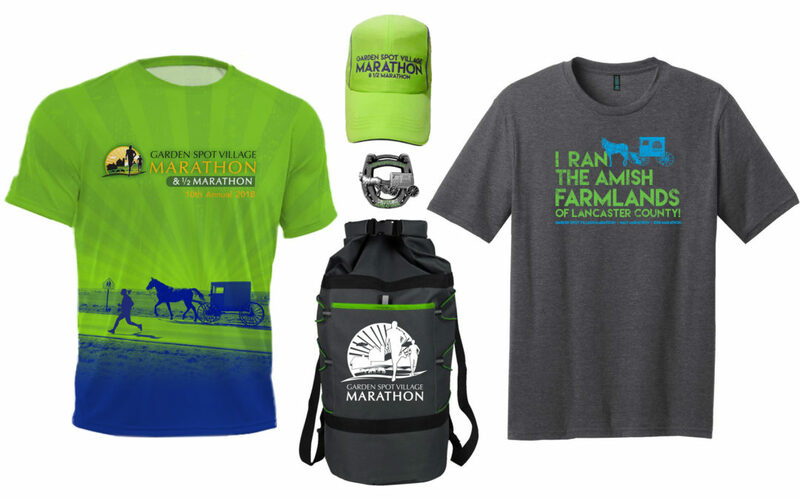 The Garden Spot Village 1/2 Marathon & 10K is a brand new course for 2019 and is located in the midst of beautiful Lancaster County farmland.